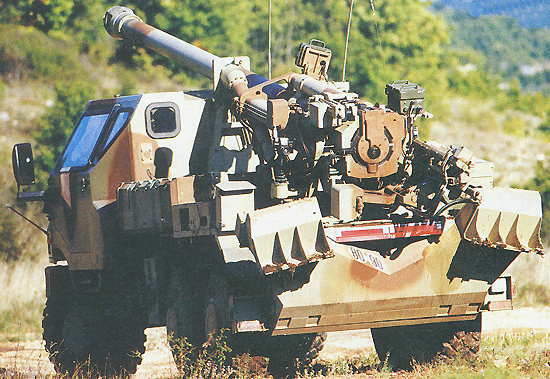 72 Caesar artillery systems have been ordered by the French Army. Caeser has been demonstrated in France, Malaysia and the USA. Caeser was designed to meet the fire support requirements of rapid deployment forces. Caesar fires conventional High-Explosive (HE) or new-generation cargo rounds. The weapon system configuration and the provision of hydraulic drives give a very short time, approximately 30 seconds, to take the Caesar out of battery. 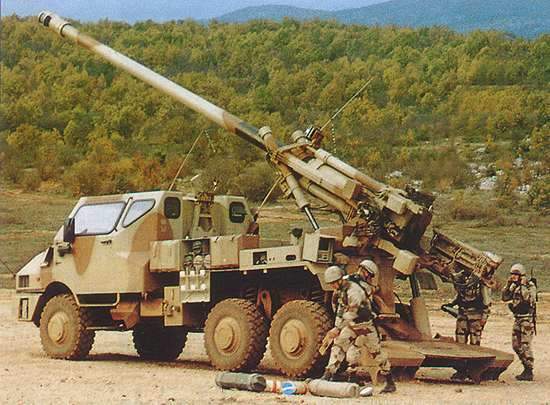 The Caesar truck mounted artillery system is a 155mm 52-calibre self-propelled gun. The Caesar prototype relied on a Sagem Sigma 30 laser gyro for navigation and aiming. 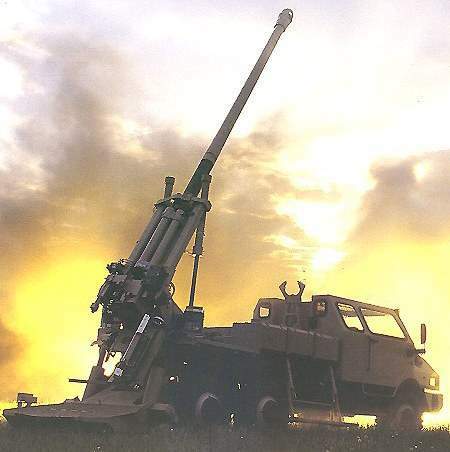 The Caesar truck-mounted artillery system is a 155mm 52-calibre self-propelled gun developed by Nexter Systems (formerly Giat), based in Versailles, in cooperation with Lohr Industrie of Hangenbieten, France. An initial five systems were ordered by the French Army and were delivered in June 2003 for technical and operational evaluation. 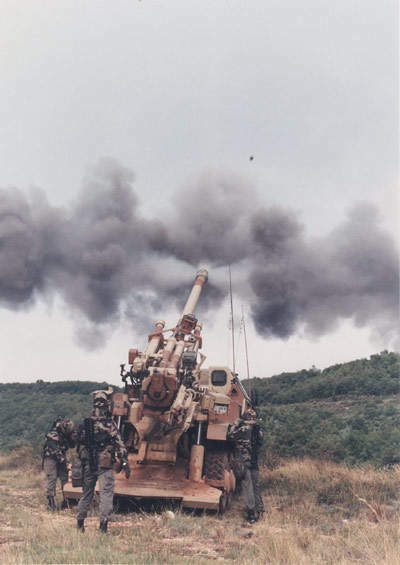 In December 2004, Giat was awarded a contract for 72 Caesar systems to equip eight land artillery batteries of the French Army, to replace towed TRF1 systems. Caesar entered production in June 2006. The first vehicle was delivered to the French Army in April 2007 for extensive firing trials. The first production Caesar system was delivered to the French Army in July 2008. Seven further systems were delivered by the end of 2008 and deliveries are scheduled to complete in 2011. The system has also been demonstrated in Malaysia and in the US. 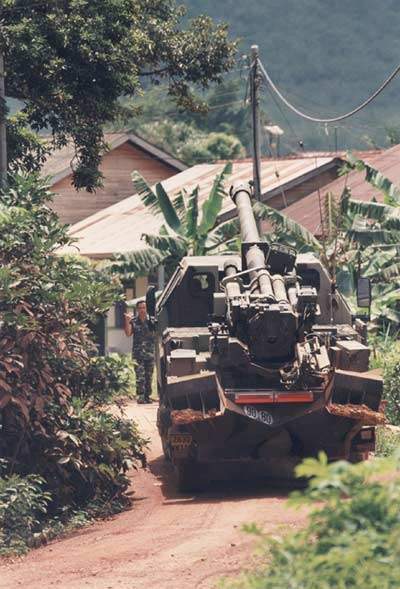 In April 2006, Thailand placed an order for six Caesar systems for the Thai Army, the first export order for the system. Deliveries were completed in 2010. In July 2006, an order for 80 systems was placed by the Saudi Arabian National Guard (SANG). These will be mounted on a Unimog 6×6 chassis. In March 2010, the SANG received first four Caesar 155mm self-propelled artillery systems. The remaining deliveries are scheduled to complete in 2011. 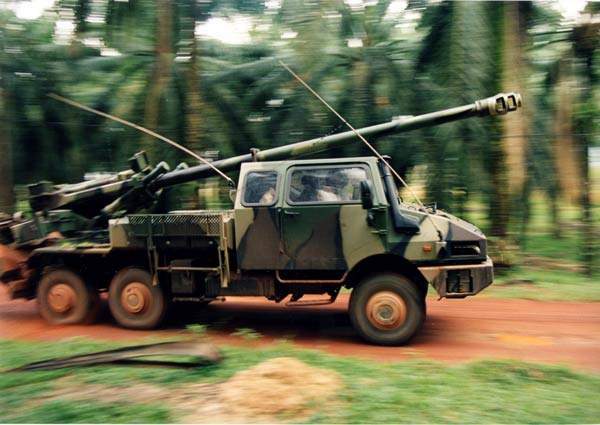 Systems for the French Army and the Thai Army are mounted on the Sherpa 5 6×6 truck chassis from Renault Trucks Defense. The Caesar artillery system evolved from the earlier 155 AM F3 automotive gun, which used the chassis of the AMX-13 light tank. Caesar is equipped with all the systems needed for independent operation, a cabin to protect the six man gun crew against shell fragments and small arms fire, an initial ammunition supply of 16 complete rounds and instrumentation for navigation, aiming, ballistic calculations and command aids. The system was specifically designed to meet the fire support requirements of rapid deployment forces. In March 2004, Giat entered an agreement with United Defense (now BAE Systems Land and Armaments) for that company to market Caesar in the USA. 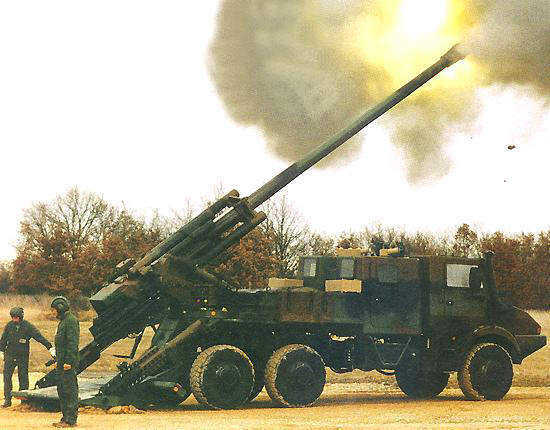 In September 2004, Giat signed a teaming agreement with ADI of Australia to offer Caesar to the Australian Army for its Land 17 artillery replacement programme. Caesar is equipped with a 155mm, 52-calibre barrel and can maintain a firing rate of six to eight rounds a minute in sustained fire, or three rounds in 15 seconds in rapid fire. "A unit of eight Caesar self-propelled artillery vehicles can dispense more than 1t of projectiles in one minute." The FAST-Hit computerised fire management system, developed jointly by Nexter and EADS Defense Electronics, an Intertechnique ROB4 muzzle velocity radar system and a SAGEM Sigma 30 navigation system and global positioning system (GPS) are fitted so there is no requirement for topographical teams and goniometers. The weapon has an automatic hydraulic laying system and the loading system is semi-automatic. The gun can be set into and out of action in under a minute. The weapon system configuration and the provision of hydraulic drives give a time of approximately 30 seconds to take the Caesar out of battery. A unit of eight Caesar self-propelled artillery vehicles can dispense, in less than one minute, more than 1t of projectiles, 1,500 bomblets or 48 smart anti-tank munitions on targets at ranges up to 40km. In the French Army, Caesar is integrated with the Thales Land and Joint Systems Atlas artillery C4I (command, control, communications and intelligence) system. The system provides onboard terminals for communications and real-time firing sequence management including fowarding of fire-support requests and transmission of firing orders according to target type, ammunition type and gun availability. Caesar is capable of using a wide range of ammunition for deployment against protected and unprotected targets, to create counter-mobility obstacles to block the manoeuvres of enemy armoured forces and to obscure or illuminate an area. Caesar can fire conventional high-explosive (HE) or new-generation cargo rounds, which provide increased accuracy and terminal effectiveness. The Ogre shell, which is in series production for the French Army, is an anti-tank and fragmentation bomblet dispensing round for use against relatively unprotected area targets such as command posts, artillery batteries, light armoured vehicles or logistic sites. Ogre dispenses 63 bomblets, each fitted with a self-destruct mechanism. The bomblets are capable of penetrating more than 90mm of armour. A salvo of six Ogre shells releases 378 bomblets to saturate an area of 3ha at a range of 35km. Bonus rounds with smart submunitions can be launched against tanks and other types of medium and heavy armoured vehicles. Bonus rounds have been developed by Nexter Ammunition and Intertechnique of France, and Bofors of Sweden. "Caesar has an unrefuelled travel range of 600km and maximum speed of 100km/h." The Bonus round carries two smart anti-tank submunitions to a range of 34km. A top-attack flight profile delivers the explosively formed penetrator (EFP) warhead to the roof of the tank which is generally more vulnerable than the heavily armour-protected sides and front. 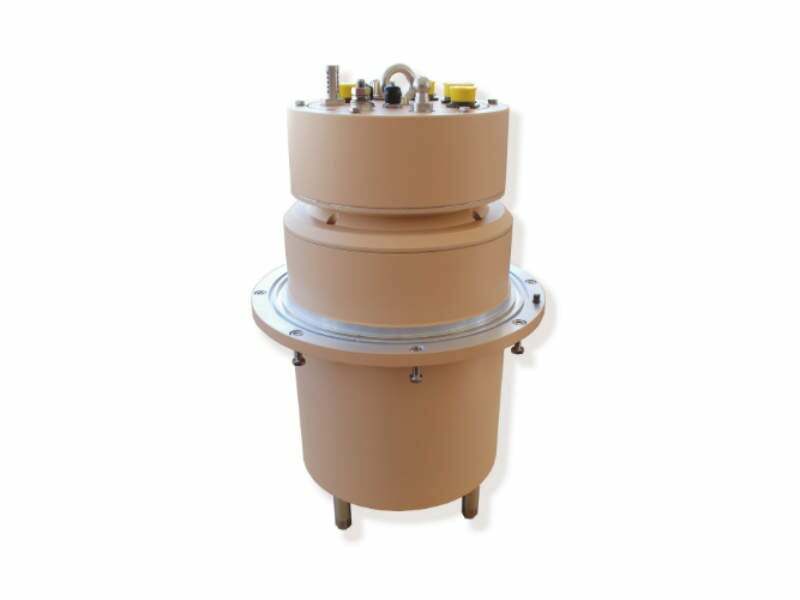 Base bleed shells provide a considerably increased range by filling the vacuum and reducing the turbulence behind the projectile without any loss of accuracy. The maximum ranges are up to 42km for extended range full bore – base bleed (ERFB-BB) rounds. Prototypes of Caesar used the Daimler-Benz Unimog 6×6 series chassis, which has been ordered by Saudi Arabia Production systems for France and Thailand are mounted on the Renault Trucks Defense Sherpa 5 6×6. Sherpa 5 has a 5t payload capacity. Caesar has an unrefuelled travel range of 600km and maximum speed of 100km/h. 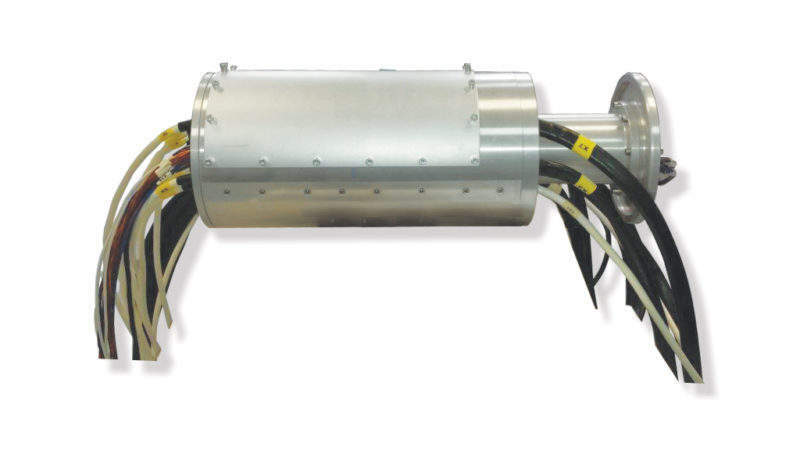 A centralised ground pressure distribution system gives speeds of 50km/h on hardened tracks. It has a six-cylinder diesel engine, developing 240hp and a power-to-weight ratio of 13.6hp/t. Excluding its crew and ready ammunition supply, Caesar can be carried in a single load of a C-130 Hercules transporter.